Born as Thomas Camp on a farm near Mapleton, Kansas on 29 May 1893, Fred Burke was an armed robber and contract killer and was a prime suspect for the St Valentine’s Day Massacre (search the related article). He had his first clash with the law in 1910 when he was 17 and five years later he joined the Egan’s Rats gang. He joined the US Army and served as a tank sergeant in France. When he returned to America Burke was arrested for land fraud and sentenced to a year in prison. On 3 July 1923 he and some gang members robbed $38,000 from the United Railways office. On 28 March 1927 he murdered three thugs who had killed his friend in what became known as the Milaflores Massacre. Eleven days before Christmas 1929 Burke was involved in a car crash at St Joseph, Michigan, while drunk. The other driver George Kool, a farmer, demanded money to repair his bumper but when the police arrived Burke fled. Patrolman Charles Skelly jumped on the running board of Mr Kool’s car and ordered him to follow Burke. Burke fired three times at the policeman who died later in hospital. Burke fled south on Highway 12 where his car was later found in a ditch. Documents in the car identified the owner as “Fred Dane”, an oilman. When the police raided Burke’s bungalow they discovered a bulletproof vest, two sawn-off shotguns, two Thompson submachine guns — a 21AC model and a 21A — pistols, thousands of rounds of ammunition and stolen bank bonds. Burke was named as America’s most wanted man and went on the run. 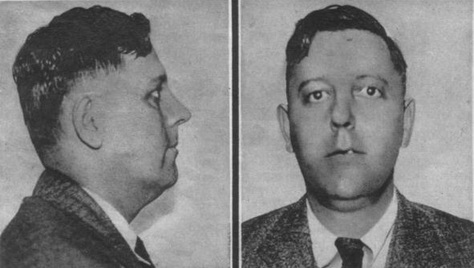 Burke was arrested on 26 March 1931 at a farm near Green City, Missouri, after an amateur detective recognized him from a True Detective Mysteries magazine. Tried and convicted, he was sentenced to life in prison. He died aged 47 on 10 July 1940 in prison from heart disease.